#101 "New Year, New Army!" New Year, New Army! 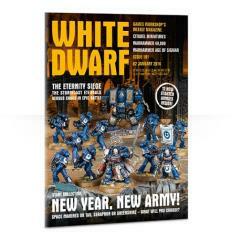 New week, new White Dwarf! This week sees the launch of 12 fantastic (and great value) new starter boxed sets, and we take a look at each of these as well as ideas on expanding them as we take an even closer look at the armies of Mars and a legion of Nurgle. Not only that, but we’ve also got an absolutely huge Warhammer Age of Sigmar battle in the Eternity Siege, featuring hundreds (yes, hundreds) of Stormcast Eternals and legion upon legion of the dread scions of Chaos for the largest Age of Sigmar clash yet seen! Check it out now.